Every so often, in addition to the Faith and Service Awards that Memorial gives out each year, the Stewardship Committee that selects the recipients chooses someone to receive a Lifetime Service Award. We have given out three of those Lifetime Service Awards so far – to Shirley Robbins in 2009, to Ted Peterson in 2010 and to Jeff Falkner last year – 2014. Each of them had previously received a Faith and Service Award, but their faith continued to inspire their service long after that award. That’s true of today’s recipient of a Lifetime Service Award as well. He received the Faith and Service Award over a dozen years ago, but his sense of service to this congregation and to the wider community has never flagged. And I know him well enough to know that he’s not going to like being made the center of attention this morning. We would have given this award a few weeks ago with the Faith and Service Awards, but our recipient was traveling through Texas at the time. So today, we are honoring John Hilliard. John has been part of Memorial for most of his life and for a good share of the life of this congregation. He was confirmed here in 1952, married Nancy here in 1957, their three daughters – Susan, Barbara and Cheryl – were baptized and confirmed here. And if there has been an activity at Memorial, he has been part of it at some point or another – singing in the choir, serving on the church Council, planting gardens, putting up Christmas trees. He helped with the building of this church. He worked at Back Bay Mission in Biloxi. He served meals at Luke House. He was part of the first group from Memorial to go to Bethlehem and, in what he recalls as a very special moment, got to read the Beatitudes on the hill honored as the place where Jesus delivered the Sermon on the Mount. 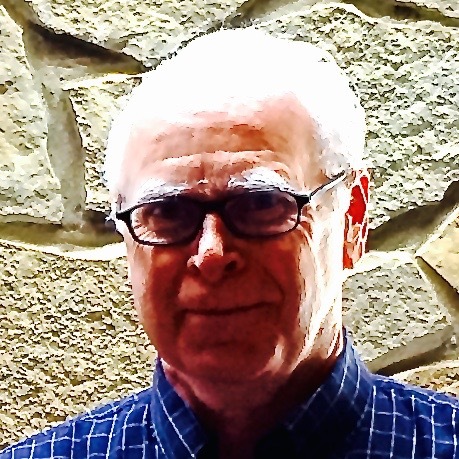 He has helped coordinate the planting and tending of memorial trees on our grounds. In the past decade, you have known him as our financial secretary – the person who keeps track of our incoming money, who has been a trusted confidant for those who have financial issues, a steady voice on the Trustees. His leadership here goes way back before that however. In recent years, John has been a very active volunteer for the Badger Honor Flights, bringing veterans of World War II and Korea to Washington DC for a day. He even got to go on one of those flights as a volunteer. So his work to the wider community continues. And for many years, he and Nancy were volunteers at the Concerts on the Square –just one more of many, many community activities he – they – have been part of. One more personal note. When I was at Memorial for six months in 2004 as a student pastor in training, John taught me early on that one of my important tasks is to make sure coffee is made for him when he is here. It’s a lesson I have kept close to my heart ever since. But there are many more important lessons I have learned from John over my eight years on the staff here. He is my go-to person for wisdom and I am so lucky and so blessed to have him here – as are we all. So John, please come up to receive your Lifetime Service Award. 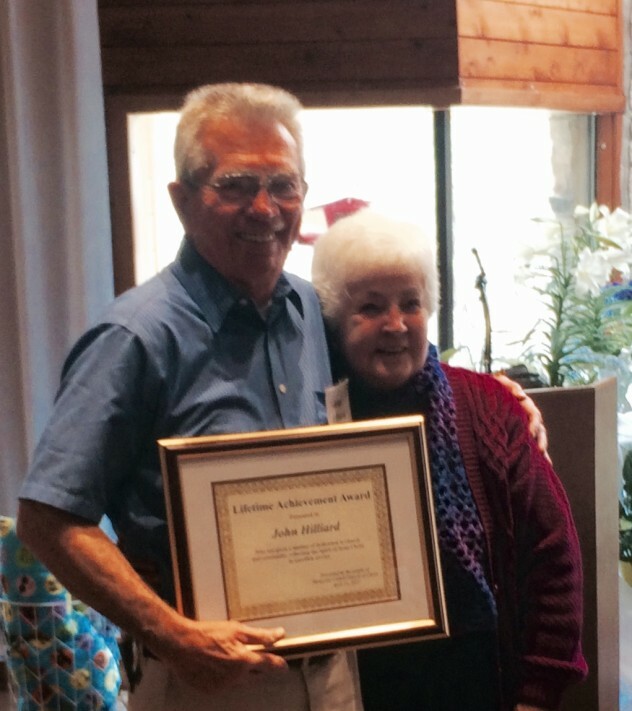 From time to time, the Stewardship Committee, which chooses recipients for these awards, designates someone for a Lifetime Service Award. We gave that award to Shirley Robbins in 2009 and to Ted Peterson in 2010. This year, the committee decided to bestow a Lifetime Service Award to the person who received the very first Faith and Service Award back in 1988. That suggests this person has been dedicated to the life of this congregation for a very long time – and he still has a long ways to go. Jeff Falkner, please come up to the front. Jeff grew up at Memorial and became a member in his own right in 1970. His ties to the people of this congregation run very deep, as does his dedication to them. Jeff’s ability to make people feel welcome here is legendary. Many visitors say the person they remember most is that Jeff fellow who greeted them at the door and made them feel at home. But Jeff is far more than a friendly face. He’s often the last person to leave the kitchen on a Sunday morning, helping with dishes, checking to make sure all the doors are locked. He proudly has “Church Grandpa” on his nametag and kids here know him from a very young age as he holds them in his arms. He backstops the nursery when help is needed there. He makes sure the ushers are on track for their duties. He visits people who are in the hospital or at Hospice. He helps the Membership Committee look for ways to meet the range of needs of people in this congregation. He’s getting embarrassed as we say all this. Because that’s how Jeff is. He retired a while back and now devotes a lot of time to being a real grandpa to Carter. His wife Diane and his family snuck in here today to join in honoring – and we get to honor Diane for a moment as well, not only for sharing Jeff with us, but because it is her birthday. Like all of our Faith and Service Awards recipients, Jeff embodies who we strive to be as a community at Memorial UCC – welcoming to all, caring for one another, being of quiet service wherever needed all growing out of a faith lived out every day. So Jeff, we give you Memorial’s Lifetime Service Award. 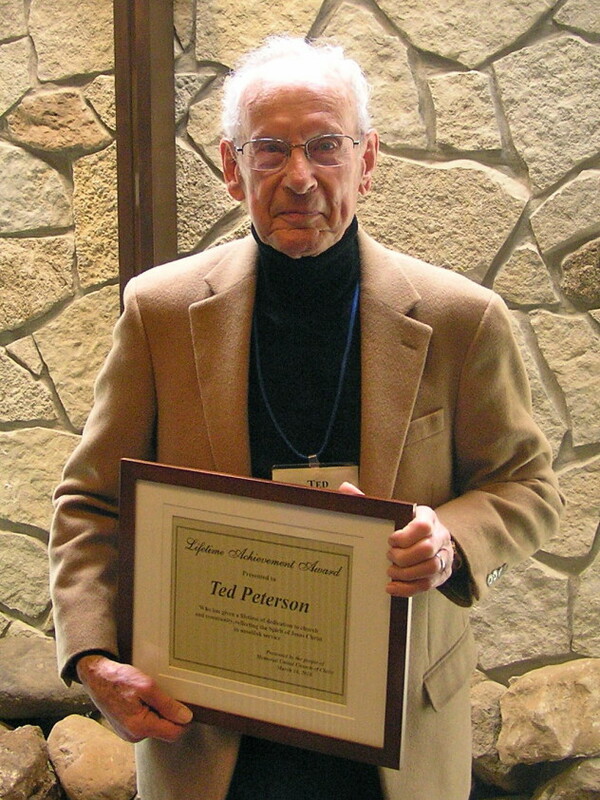 In honoring Ted Peterson for a lifetime of service, it is first important to recognize that he has spent all of his Tedadult life as a member of Memorial UCC. He sang in the choir for over 50 years. He has held just about every office there is to hold in the church, including financial secretary, Council member and most recently, trustee. In fact, it was Ted’s departure from the trustees that triggered this award. Not that we expect Ted will stop being involved in so many different areas of church life. It’s just that we recognize that he is limited his involvement just a little bit. That involvement included being a leader in the move of Memorial to Fitchburg in the mid-1980s from its longtime home on Madison Street near the old UW Fiedlhouse. He helped bring Memorial into the computer era, even troubleshooting troubles with our computers from vacations in Florida. (It is also worth noting that he donated much of the hardware and software that enabled us to build our computer systems here. He was instrumental in putting in the software we use to manage all of our church financial and membership information. He also helped Memorial be one of the first congregations in the area to have significant presence on the web. He built our early web sites and maintained them. As other folks came in with web skills, he helped make the transition to a new generation of web folks just seamless, cheering them on as they built on his work. He was part of Pastor Bonnie’s groups that went to Israel and Palestine and became a strong advocate for our Palestinian Christian partners. And when folks enter Memorial during the Christmas season, they are awestruck each year by the beautiful tree that stands in the narthex. For 30 years – going back to the days of the church on Madison Street — Ted has lined up the tree that graces our church. At Luke House, as our congregation serves the evening meal on the first Monday of the month, Ted has been there from the earliest days a quarter century ago, always taking care of scrubbing out the pots and pans — one of the least glamourous jobs, but one that Ted knew needed to be done – and so he did it. That’s the spirit that led to Ted and his late wife, Marie, receiving the Faith and Service Award in 1996. It’s a spirit that continues in Ted’s quiet but dedicated service to this congregation across a lifetime. Shirley and Sam Robbins first came to Memorial just as this congregation was bidding farewell to its church on Madison Street. In that time of transition, they quickly became part of the community, with Sam sharing his wisdom from years in ministry and Shirley adding her vibrant presence to so many parts of our congregation. Those of you who have seen Shirley here over the years know her work in so many different facets of the life of this congregation. She and Sam were honored in 2000 with the Faith and Service Award, the special recognition this congregation gives on an annual basis. But that hasn’t kept people from nominating her in more recent years, because activity around here never seems to stop. In the 1990s, she helped organize our Prayer Chain and our Chariot Ministry. She was the person who followed up with visitors to our church. She taught Sunday school and even directed the Sunday school program for a while. She has served on the council, was a council president and remains a presence at council meetings as recording secretary – although the council did manage to approve this award without Shirley ever actually knowing she was the recipient. You see her in the vocal choir and the bell choir. For the last six years, she has chaired out Outreach Committee and has been the driving force behind our congregation’s connection to Allied Drive. That food you bring in every month? Shirley is the one who delivers it to the food pantry. But that is just one of the ways she connects to the wider community. She was a long-time volunteer at the Domestic Abuse Center, has worked for years with the Madison Ecumenical Center and has been a leader in Church Women United. And when there is a cause of peace or justice that needs another voice, Shirley’s voice is right there. The list goes on and on. 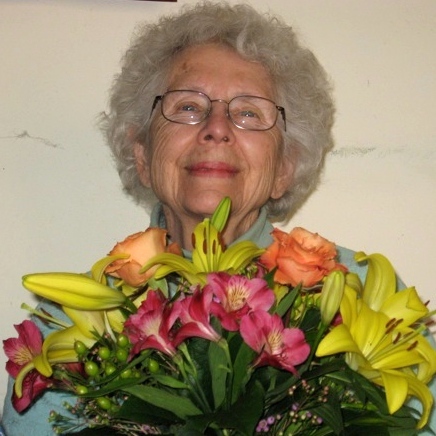 So at our April 19 service for our 20th anniversary in Fitchburg, we honored Shirley for a lifetime of service to the world and for a generation of service at Memorial than coincides with our move to Fitchburg. “How humbling and how thrilling to be given Memorial’s first Lifetime Service Award! I don’t see myself as deserving it. Through all my years as a minister’s wife, I never did more than I expected other women in our churches to do (sometimes ignoring what they expected of me!). Many were the examples of church women who did much more. This church family has given me far more than I have given back. I loved the other churches we were part of, but always knew we would soon leave. Here, for almost 22 years, I’ve seen little children grow up and I have grown – well, older – with friends. It’s my church, and I will never leave. Maybe some day I will be a chickadee at the bird feeder along with cardinal Sam. Thank you!